PARIS, 1 December 2004The beautiful young Indian dancer, Shantalala Shivalingappa, who guested at the Théatre de la Ville with Pina Bausch in Nefés last season, returned to the scene in Paris in October with a programme of kuchipudi, a classical dance style from Southern India dating back to the sixteenth century. She presented her own creation, Shiva Ganga, with musicians J.Ramesh, B.P.Haribabu, M.S. Sukhi and K.S. Jayaram in the pretty Théatre des Abbesses at the end of October. With her long dark hair, delicate features and expressive almond-shaped eyes, Shantala, now twenty-seven, is as enchanting, as gentle, and as exotic as her name. She was born in Madras and her parents, who were already established in Paris, brought her to the French capital when she was only a few months old. Daughter of the celebrated choreographer, Savitry Nair, who taught not only in Paris, but at Mudra, Béjart's school in Brussels and with Bausch, Shantala began taking classes once or twice a week around the age of seven. "But at the same time my father encouraged my studies, and I'm very pleased that he did", she told me, "because after attending a bi-lingual school , bi-lingual because we always spoke English at home, I obtained my degree and an M.A. in ethnology at the Sorbonne. But every holiday was spent in India, where my real training as a kuchipudi dancer began. It wasn't that I wanted to be a dancer", she said as we chatted in a small coffee bar near her home, "but more that I grew up with music and dance and simply enjoyed it. ". However, the revelation came when Shantala was fifteen and took part in a choreography her mother had created for The Place in London, for Dance Umbrella festival. 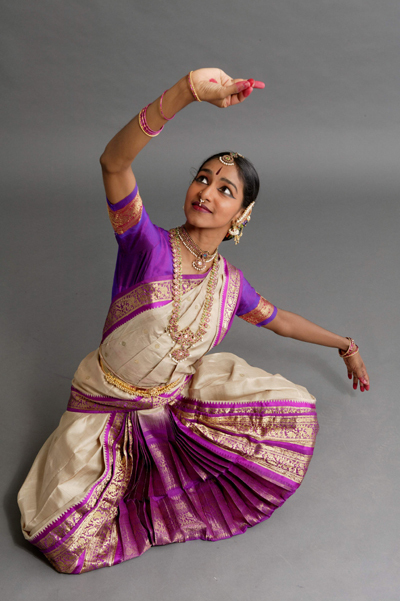 "My mother wanted me to learn a variation in kuchipudi, and the moment I did, something clicked and I realised that was what I wanted to do with my life. 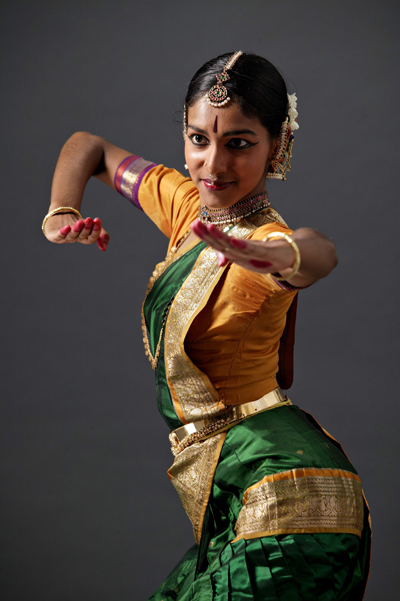 There are many different classical dance styles in India", she explained. "Akram Khan, for example, specialises in Kathak, from North India and Pakistan. The footwork is very complex and the emphasis is much more on rhythm. My mother herself specialised in Bharata Natyam, a refined, evocative style concerning religious subjects. Kuchipudi, a sacred dance originally danced by men, is extremely rapid and uses this beating on the floor with your feet. It's very strong on the floor with quick precise movements. The lines are neat and pure, and at the same time it's very graceful". Indeed, the rapidity of her tiny feet was emphasised by the ankle bells, and her slender, fluid body in its traditional Indian costume was a mass of harmonious curves. Her almost liquid turns and soft, feather-light leaps and dips were an absolute joy to watch. Many in the audience broke out into exclamations of wonder; it was such delight to watch her. "Dance for me is joy and beauty", she said," and my master, Vempati Chinna Satyam, with whom I work in Madras, has forged a very personal style full of elegance and purity. It's important to me to get this style known in the world. I want to change the stereo-typed image that some people have of Indian dance. I don't only dance for myself, but for my musicians and my audience. We are there to share something and be happy, and it doesn't matter if people don't understand the story or the significance of certain gestures." Shantala's work is very much open to contemporary influences. "I got such a shock the first time I saw a work of Pina Bausch ", she said, "it was so amazing and totally outrageous. I'd never seen anything like it before! And then I met her and got to know the company. I was dazzled by the quality of the dancers and by the wonderful atmosphere in the troupe. "And then Bausch herself is such a warm and loving person. I enjoy the way she works, giving her interpreters both freedom and the confidence to do things they think they can't. Dancing with them is such a pleasure, although they still over-awe me on stage; they have changed the way I am as well as my attitude to dance. Pina has given me a different quality of movement". Apart from Bausch and when not in India, Shantala Shivalingappa tries to see as much dance as she can, preferring to watch a rehearsal rather than an actual performance, and being more attracted by the dancers themselves than by any choreographer in particular. Akram Khan cropped up in her conversation as well as Ana Laguna and Marie-Agnès Gillot of the Paris Opéra Ballet, while flamenco holds a special significance for her. Taking classes is not part of her schedule. "I need to conserve all my energy for my performance" she said. "There's no tradition of warming up in Indian dance, maybe because of the climate. Unlike classical or contemporary ballet it does not stretch one's body into unnatural positions or hurt it in any way. It might look spectacular, but all I have to do is work on my foot movements and be awake, alive, and ready to dance". Her mission, she said, was to spread a little of Indian culture around the world. Patricia Boccadoro writes on dance in Europe. She contributes to The Observer and Dancing Times. Ms. Boccadoro is also the dance editor of Culturekiosque.com.